We hope your student and family had fun participating in our Walk-a-thon last Friday, September 27th.The weather was perfect and we had so many wonderful parent volunteers. Thank you to everyone who pitched in to make it such a special day. Big Thank You’s to the Elsie Allen High School Drum Line, whose precision and music mesmerized us all and to Matthew Seghezzi from Dansations DJ + Event Services for keeping our kids pumped up with great tunes for the 3rd year in a row. Did your child enjoy peeking his / her head in the special wood cut out featuring a boy and girl “walking across America?” It was lovingly created and painted by Valerie Martin, Mom to Jack Lazark in Mrs. Cartan’s class. Thank you Valerie! There were so many kids running, in addition to walking! It seemed they were all excited to earn their rubber bracelets and sports necklaces. We handed out 393 blue bracelets (10 laps), 247 white ones (25 laps), and 45 red ones (50 laps). 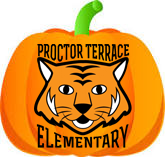 18 students walked 75 laps or more — that is a Proctor Terrace record and that mileage is equivalent to a Half Marathon! When students checked out, they received a Yogurt Farms free frozen yogurt coupon. Please enjoy this treat generously donated by Todd Phillips, Yogurt Farms owner, before October 28th (expiration date). Students can now turn in their pledge money. The deadline to submit money to be considered for prizes is Friday, October 11th. Money can be turned in after October 11th, however it will not be applied to student prize categories. If your child did not participate in the Walk-a-thon, please consider a flat donation. This event is the PTA’s main fundraiser of the year! Online donations can be made on the school website via Paypal. Checks should be made out to Proctor Terrace PTA. Any student who turns in $10 or more will be entered to win an ipod Nano generously donated by 3rd grade teacher, Nancy Cartan. The winner will be drawn and all awards announced at the Awards Assembly on Friday, October 18th. Awards Categories include Top Walkers, Top Earners: Individual and Classroom. Also, if we raise $35,000 or more, Mr. Mayer will do a tricycle race after the Awards Assembly. Tiger togs will be coming home this Friday or early next week. 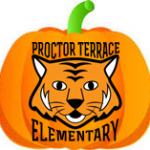 The PTA will supply one free tiger tog for each student at Proctor Terrace to celebrate the fantastic new logo designed by Proctor parent, Megan Williams. We are still looking for a tiger tog coordinator for this year. If you would like to help, please let us know. First Daytime PTA Meeting – Tuesday, October 8, 2013 from 8:30 – 9:30 a.m. in the multi-purpose room. The agenda can be found in next week’s blog or in the hallway outside the PTA office. Everyone is welcome.Coffee and donuts provided. We hope to see you there! 32 schools in our county will be participating! Preparations are underway for Proctor Terrace Elementary School’s annual Halloween carnival. Tigerfest is hosted by the PTA and can only happen with your support. If you can help, please return form to your child’s teacher or to the front office. Click here for the Tigerfest form. All games & food items at Tigerfest are paid for with tickets. Games cost one ticket each. Beverages cost 2-3 tickets, snacks cost 2-3 tickets, & meals cost 5-7 tickets. This year we added a double-sided slide and new food items. Sign ups will be available online soon. Pre-order your tickets by Wednesday, October 23rd and receive 3 tickets for $1.00. Click here for the pre-order form. USA Tennis with Rachel Blum on the blacktop – Fridays – October 11, 18 and 25, and November 1st. Delayed until next week in hopes of getting more students signed up. PGA Golf on the field – Thursdays October 3, 10, 17, 24, and November 7th. Move Over Mozart – Thursdays starting October 3rd. ¡Disfruta! – Starting September 25 and 26th for 5 weeks and 10 weeks.